A thousand years have passed since the evil wizard T´Siraman fell, but men still fear to enter his dark fortress of Dragonfire Castle, which squats grim and brooding atop Wyrm´s Craig. In the villages that huddle in it´s shadow, stories are whispered of the fabulous treasures which fill the castle´s dungeons, and of the Things which guard them. Old men draw closer to their fires and tell of the noises which echo across the valley at night, when the castle seems to take on a malign life of its own. Few indeed return in daylight; their eyes are troubled, and they are reluctant to tell of their adventures. None has ever resumed after nightfall. The ruddy light of sunlight begins to burn off the autumn mist, and four pairs of eyes look towards the looming keep. Four minds reflect on the villagers´ tales, and four hands tighten their grip on four weapons. Sir Rohan the Knight, with his shining armour and greatsword; Ulf Grimhand, the Barbarian from the far north, with his huge double-headed axe; El-Adoran the Ranger, with his deadly longbow and the forester´s shortsword; and Volrik the Brave, the swaggering Adventurer. Fools or Heroes ? Only time will tell. Each of the player starts the game at one of the corners of the gameboard, while the treasure room containing a terrible dragon is at the center of the board. The players don´t know which way they can take to reach the treasure chamber, since there are no corridors on the board. 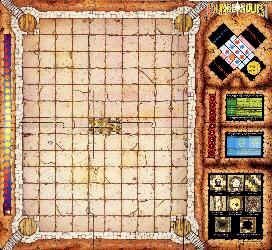 So each turn each player has to draw a random room tile which he has to fit onto the gameboard, thus allowing the player to travel through the castle. But unfortunately these room-tiles are not always straight corridors or crossings. Sometimes there may be unexpected turns which will again lead away from the treasure chamber, taking precious time to find a detour. Even more important are the bigger rooms the players may encounter. Here they have to draw a random event card from the room-cards deck, showing an event from a large variety like attacks, trap, treasure, a corpse etc. Players may lose lifepoints here, but they may also gain treasure or arefacts which will help them on their quests. There are also special room tiles containing many kinds of obstacles, like Cave-Ins, Traps, Chasms, Pits, Rotating Rooms, Doors, Portcullis etc, with all these obstacles taking the players valueable time to overcome. If a player has finally found a way to enter the treasure room, he will discover that the Dragon guarding the treasure is asleep. This enables the player to take 2 random treasure items a turn, but he also has to draw a Dragon´s counter to see if the Dragon awakes. After taking a share of the treasure, the players have to leave again in order to reach an exit before the sum will set. Finally the player who left the castle with most treasure wins the game. Obviously there were some more gamers who liked the game, since Games Workshop went as far as producing two expansion sets for Dungeonquest. The Burial Service was Brief and to the point. The initiate intoned the formula from memory, in a flat voice that has spoken the names many times before. Long before the end, most of the pitifully small band of mourners had chosen to step from the cold shadow of Wyrm´s Craig, and trot briskly towards the advertised warmth of the tavern door. Looking up from his devotions, the initiate realised the pall bearers had gone with them. He looked nervously at the four who remained, thought better of the question that came to mind, and scampered off to find someone who would lower the body into the grave. "In all honesty" laughed Ulf Grimhand, "I didn´t think he would make it back. I mean, some First Timers just look like Dragon Food." The others nodded. The sentiment might not have suited them, but they recognised the accuracy behind it. Sir Rohan looked up at the Castle, which was bathed in an awkward sunlight, which softened the grim image which was burned into his mind. "There isn´t a man alive now who has been into the Castle and returned, save those who are standing by this grave." "All the more Treasure left for us, then" cackled Volrik, who was ever to see the potential profit in any situation. "T´Siraman will get us eventually," growled Ulf, "But I think we can expect a little more profit from the enterprise first." El-Adoran kicked some dirt into the grave, and made some gesture with his hand that might have been a mark of respect or might have confirmed that he too thought the ex-adventurer was Dragon Meat from the day he arrived. "It takes a lot of the pleasure out of the game if we four are the only ones left going up there. If there aren´t hordes of other fools coming here to be slaughtered, we shan´t get the credit we deserve for our pains." "I don´t want to share the Treasure with anyone !" snapped Volrik, but he held up his hands in front of the advancing bulk of Ulf Grimhand to show that present company was excepted. "The way you are going, I hardly think that emptying the Wizard´s vaults is a problem", Rohan smiled. "It´s been at least three months since you came out with a battered gold cup und your sword bent like a horseshoe. I think we could afford to advertise for some new blood..."
"Blood´s right !" howled Ulf, greatly amused. He composed the proclamation on the spot. "Adventurers Wanted for Dungeon Quest. Pay excellent. Prospects poor. Only Fools or Heroes need Apply." In Heroes for Dungeonquest 12 new characters are introduced to the game. These new charcters aren´t simple fighters like the heroes contained in the basic game, but they are from a large mix of fantasy professions. Tori-Jima the Ninja, having a Blowpipe and 4 Shuriken and being able to hide in shadows. Helena the Swift who can run through the castle at higher speed and use a slingshot. Farendil, an Elf-Ranger equipped with a Bow. Serellia of Zimendell with her faithful dragon Flame Bright who will fight for her. Fhyll Madaxe, a dwarven Berserker. Azoth the Faceless, a Sorcerer with six powerful spells. Rildo the Crafty, a thiefwho can pick locks and throw daggers. Thargrim the Dark Lord, wearing a Helm of Terror allowing him to frighten monsters. Ironhand The Mighty, a gladiator of brutal strength. Siegfried Goldenhair, Vikas Swordmaster and Sir Roland, being formidable knights and replacing the original fighthers. All these charcters are suplied in Citadel lead miniatures, giving the game a much more realistic look. Due to their special abilities, these character also give more possibilites to the players, although the basic principle of "High Luck" isn´t changed. Even with these characters the high solitaire suitability of the game remains ! Once again four figures stood at the foot of Wyrm´s Craig, heads back, eyes seeking a way through the mist. They fingered their weapons nervously, with an air of those who know what awaits them. "The problem," said Sir Rohan in a soft voice, "isn´t so much the Dragon, it´s getting to the Treasure chamber in the first place." "I´ve managed it !" sneered Volrik, ever confident. "And brought back nothing for your pains !" replied Ulf Grimhand, shaking with laughter. His voive echoed off the side of the mountain. "If there was any other way through Dragonfire Castle..." whispered Rohan. "Maybe there is..." El-Adoran ran his hand through his straggling hair. "When last I ventured within, I found a passage that led down into the depth of the Castle. By the light of my torch, I could see there were endless Catacombs, honeycombing the lower levels of the Castle. They look deserted !" "Nothing in T´Siraman´s Castle is ever unguarded," jeered Volrik. "Maybe not," said Rohan, clearly. "But tomorrow, perhaps, we will explore the Catacombs, and see where those passages lead." "Right under the Dragon´s - !" cried Grimhand, making an obscene gesture with his hand. Rohan sniffed the air disdainfully. "There´s just one thing," added El-Adoran. "I´m not entirely sure how you get out of the Catacombs once you have gone down there." The other three turned from him to stare once more up at the Crag. It looked as if their Adventures in Dragonfire Castle were about to take a new twist. The other expansion are the Dungeonquest Catacombs. This expansion doesn´t introduce any more charcters, but a whole lot of new room tiles and cards, treasures, monsters etc. Furthermore, the castle gets a second floor in form of catacombs below the mainboard. The players travel through these Catacombs by cards, and they may reappear almost anywhere on the gameboard. With both of these expansions, the game becomes quite a thrilling experience and today the basic game and the expansions have become collector´s items. My evaluation is given on the whole game plus expansions. Dungeoquest Characters in Talisman: If you have the Games Workshop game "Talisman" you might want to use two of the Dungeonquest characters in Talisman. I have redesigned Farendil and Serellia for Talisman, and they are ready for you to print them out ! Robin Hoods Gaming Group has done some Houserules for Dungeonquest. Click here to check them out ! I have decided to put up a Highscore-Chart for Dungeonquest. If you want to have your highest Dungeonquest result published in this chart, please send me an e-mail. But remember the Code of Honour: No Dungeonquester may cheat !!! Lydia Watts Ulv Grimhand 880 Gold R.I.P.